We are located on Main Street (Route 44) in Winsted. FROM ROUTE 8: Route 8 north to the end, turn right, follow route 44 (Main St) west into town, pass 2 traffic lights, look for our blue awning on the right side of the street. Parking lot available to the side and back of building. Questions/comments? 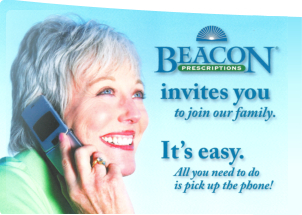 Email jpalmeri@beaconrx.com or click here.